#SDB0005 - Lord of the Rings. Folio Society Goat skin Deluxe limited edition (1,750) - 5 set edition LotR+Hobbit+Silmarillion. Don't miss this rare opportunity to own a piece of history. 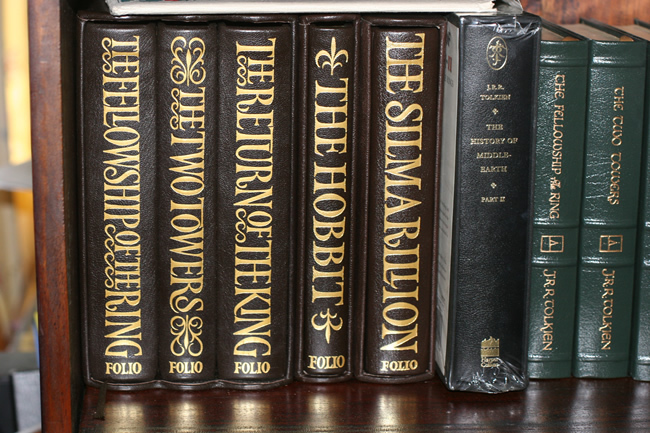 Folio Society Limited Numbered Editions, Five Book Set, Includes The Hobbit, The Lord of the Rings and The Silmarillion. Now available as a HAND BOUND LIMITED EDITION in a magnificent new binding of Morrocan goatskin leather and pure Indian silk. All are individually numbered and limited to just 1750 copies. A must for all Tolkien fans and serious collectors as well! This printine set of 5 books and 3 slipcases, is still housed in the original Folio Society shipping boxes with their printed limitation notice on the end. Remarkable to find one in this condition, let alone the complete set.